Royal Caribbean's new Quantum of the Seas ship will feature virtual balconies in each of its interior staterooms so that all guests can experience views of the ocean from their cabins. The virtual balconies are made up of 80-inch, 4K high definition screens, which are installed on the far wall of the room. The screens stream real time footage of the ocean taken from high-speed cameras positioned around the ship. Graphic components of a balcony, such as a railing and floor, are overlaid on top of the live images. 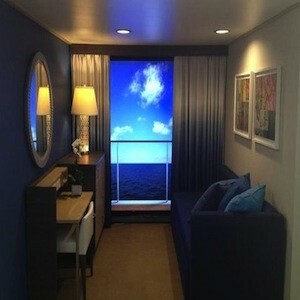 Sounds have also been added to the gadget to further simulate the experience of being on an actual cruise balcony. In addition to the virtual balconies, the luxurious new cruise ship will feature a lineup of what Royal Caribbean is calling “firsts at sea”, including a robot bartender, an indoor sky-diving facility, bumper cars and a glass capsule that transports guests more than 90 metres in the air to deliver 360 degree views of the ocean.